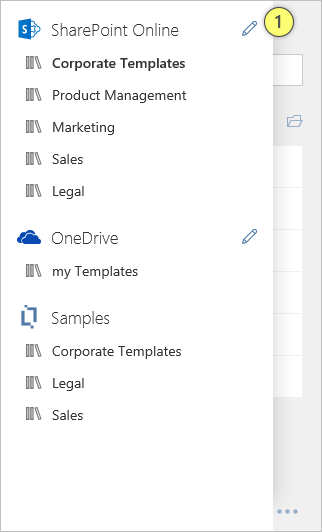 The Template Chooser supports three types of Libraries, «SharePoint Online» libraries, Teams libraries, OneDrive and OneDrive for Business Libraries and «Samples» libraries. To switch a library just click on the name of the existing library (1) at the top of the Add-In. That will bring up a list of all available libraries for you to choose form. You can then just click on one of the libraries to switch. At first you might have not configured your Office 365 SharePoint Tenant for the «Template Chooser». In this case, you will find a «Learn more» link (1) below the «SharePoint Online» library header. So if you want to configure your Office 365 Tenant’s «SharePoint Online» to work with the «Template Chooser» just click on the «Learn More» link and follow the instructions presented on the web page. Once your Office 365 Tenant’s «SharePoint Online» has been configured for the «Template Chooser» you will see a list of all available document libraries you have access to. The libraries are listed below the «SharePoint Online» group header. If you want to manage the lists of «SharePoint Online» libraries just click on the «Edit» button (1) to the far right of the «SharePoint Online» group header. This will open a dedicated «SharePoint Online List» in your Office 365 Share Point Online Tenant. The URL of the list will be something like this: https://[YourTenant].sharepoint.com/sites/officeatwork/TemplateChooser/Lists/TemplateLibraries. 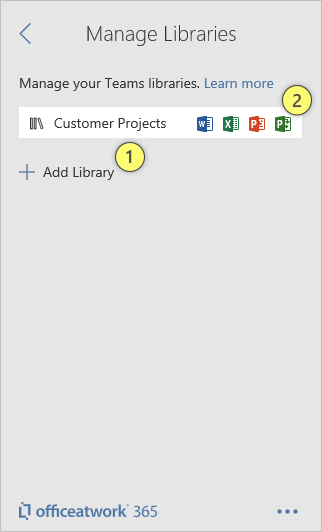 The actual adding and removing of libraries can be done using native «SharePoint» functions. If you are not literate with «SharePoint Online» we recommend you to go through the «SharePoint» documentation or to reach out to someone with sufficient «SharePoint» experience. 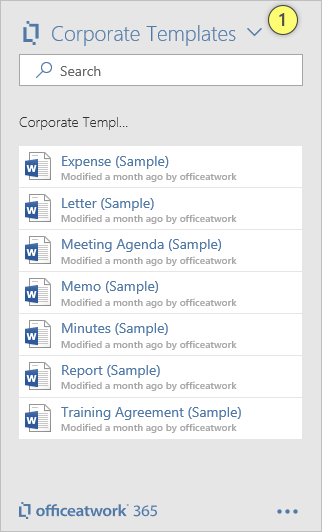 https://[YourTenant].sharepoint.com/sites/officeatwork/TemplateChooser/Templates. The Application column will allow you to determine in what Office application the library shall appear. Tip: The libraries you use can be located in any site collection within your SharePoint root host of our Office 365 Tenant’s «SharePoint Online». Tip: Use the rich security options provided by «SharePoint Online» to determine what libraries are made available to users and groups within your organization. Please note: The user will need at least read rights to the root site of the site collection you are connecting to. 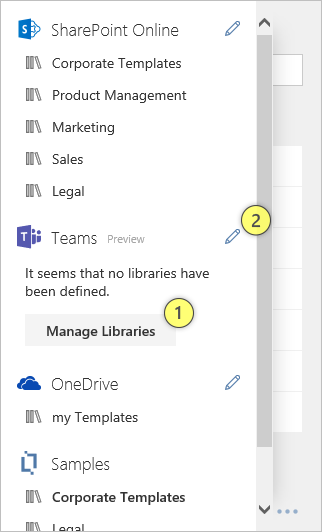 The Teams libraries feature is currently in preview as we are using some Microsoft API’s that are in preview. As soon as Microsoft makes those API’s general available we will be making the Teams libraries feature also general available. Please note that Microsoft can still make changes to their preview API’s before making them general available. In this case we will have to accommodate those changes before we can make our Teams libraries feature general available. Thank you for your understanding. Initially you need to enable the Teams libraries feature. To do this you click on the enable (1) button. This will start an admin permissions flow that only Office 365 Administrators can complete. At first you might have not configured your Teams libraries. In this case, you will find a «Manager Libraries» (1) button below the «Teams» library header. If you already have setup some libraries, you will not see the «Manager Libraries» button. In this case, you can use the «Pen» icon (2) to start managing your libraries. To create a new library just click on the «Add Library» (1) button. A fly-out appears, that will allow you to select a Team, a channel and if you wish any sub-folder within that channel. Navigate and select to the channel or folder you wish to use as a Template Library and click on «Create Library» button at the bottom of the list. With this you have created a new Template Library linked to the channel or folder you just selected. 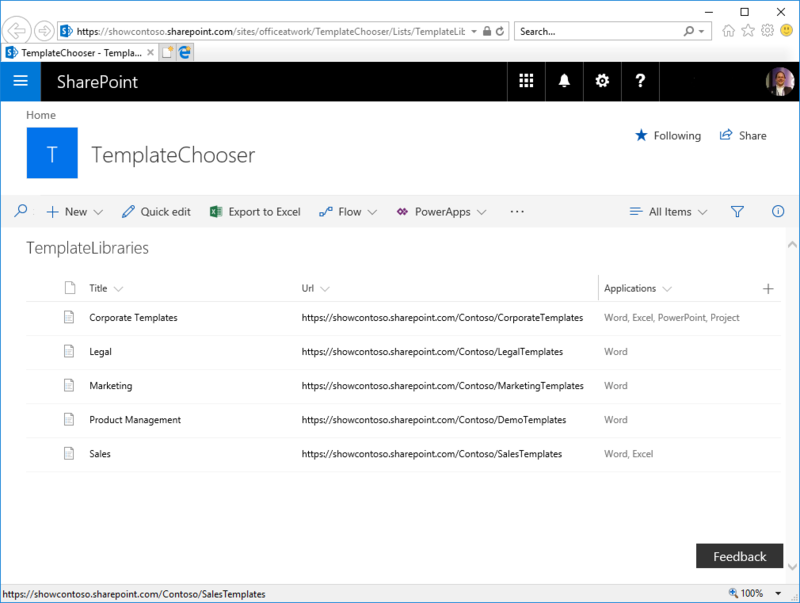 Be aware that you can only create one Template Chooser library per team. So once you have created a library for a specific Team that team will not show up anymore in the fly-out. Once you have created a Template library within a team that library will become visible for all your team members. There is no need for all team members to repeat this step of creating a teams library for any specific team. To edit an existing library just click onto the library entry (2) in the list of libraries. To remove the library just click on the «Remove» button at the bottom of the library properties. You can not rename a Teams library as it will always show the name of the Team as the library name. Use the arrow back at the top of the page to return to the libraries list. 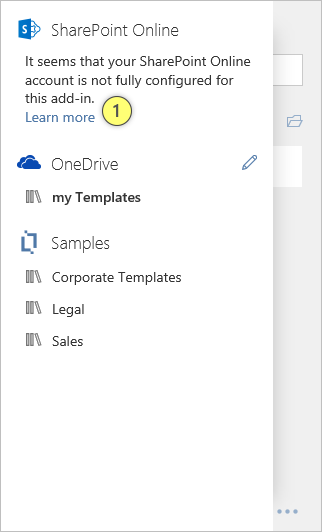 At first you might have not configured your OneDrive or OneDrive for Business for the «Template Chooser». 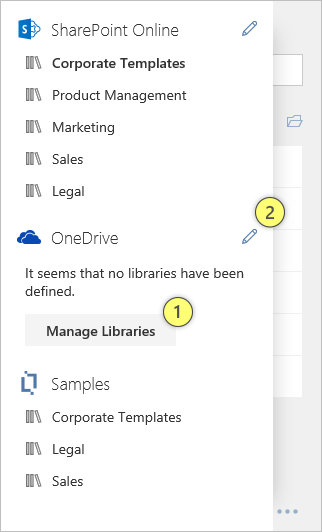 In this case, you will find a «Manager Libraries» (1) button below the «OneDrive» library header. If you already have setup some libraries, you will not see the «Manager Libraries» button. In this case, you can use the «Pen» icon (2) to start managing your libraries. Please note: Organizational users that sign in with their Work or School account can choose to disable OneDrive support within the Template Chooser. 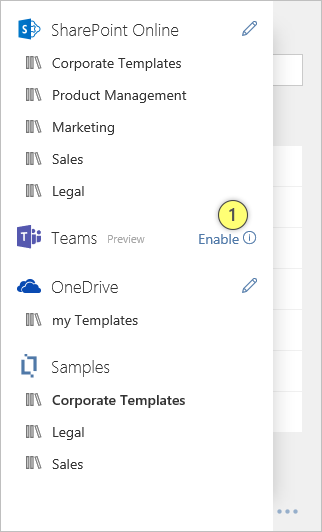 This can make sense in case you want all your templates organized in SharePoint and not promote the management of templates on an individual level. To create a new library just click on the «Add Library» (1) button. A fly-out appears, that will allow you to select a folder. Navigate and select to the folder you wish to use as a Template Library and click on «Create Library» button at the bottom of the list. 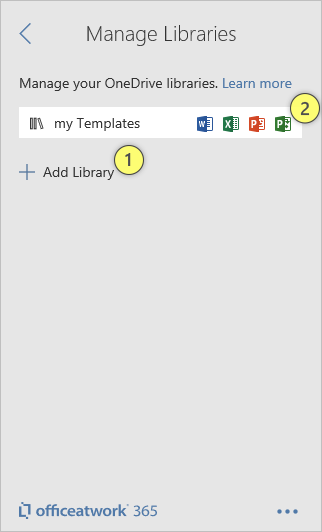 With this you have created a new Template Library linked to the folder you just selected. To edit an existing library just click onto the library entry (2) in the list of libraries. To remove the library just click on the «Remove» button at the bottom of the library properties. To rename the library just click into the «Name» field and change the name accordingly. Use the arrow back at the top of the page to return to the libraries list. The «Samples» libraries are here to help you to get a feeling of what the «Template Chooser» add-in can do for you without the need to setup your own libraries. If you have not set up any of your own libraries the «Template Chooser» will always select the first «Samples» library for you by default when loading the libraries page. Please note: All sample libraries including the «Samples» group will not be visible to organizational users with a Microsoft 365 or Office 365 Work or School account once you purchased a subscription and become a licensed user.